Ben Schiller is a writer for Fast Company, who has written about inclusion in tech. He recently tweeted at Village Capital’s President and co-founder, Ross Baird, with a disturbing story. Now, we’d like to acknowledge that we don’t know who this investor is, and we don’t have the context of the rest of the email. If the investor who wrote this would like to respond to this blog, we’re all ears. 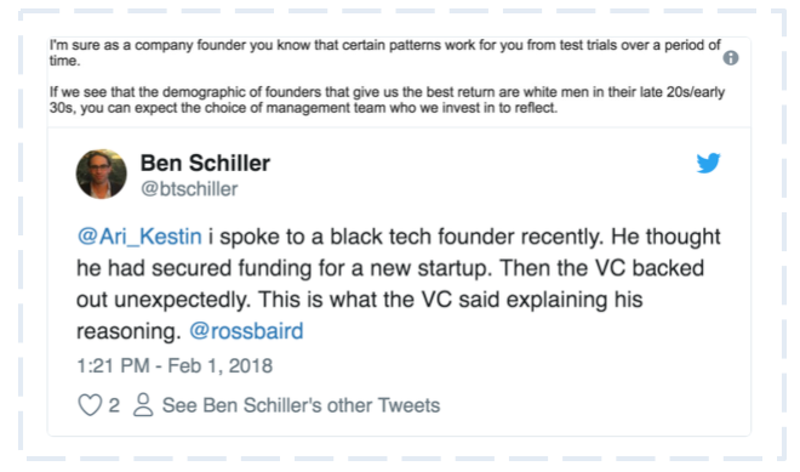 But it sure seems like this investor is saying out loud what most investors only imply: We’d rather invest in white founders. There’s a term used a lot in politics, dog whistling, which means saying something without really saying it. A politician might talk about “law and order” when they’re really trying to whip up fear of minority communities. … that’s dog whistling. It’s a wink-wink acknowledgement that lots of VC investors — 90% of whom are white men — have a bias toward familiar faces. This bias isn’t always conscious. But it’s there. And it’s how we got to the point where less than 1% of venture capital goes to Blacks or Latinos, and less than 5% goes to women. One interesting part of this VC’s statement is that he argues that white men of a certain age make for the best investments. That may be what he found when he crunched his numbers. But it’s a dubious accomplishment when you consider that VC as an asset class underperforms — and it’s also worth noting that the numbers aren’t all that convincing — plenty of data shows that diverse teams outperform. Fortunately, there are people thinking about how to get past this conundrum. Ben Hecht, CEO of Living Cities, responded to the above tweet by tweeting that we need a “new generation of fund managers and choices beyond traditional venture capital”, and in fact his organization has been testing new models like “mobilization funds” to help entrepreneurs of color win contracts. Kapor Capital intentionally invests in Black and Latinx entrepreneurs, with Brian Dixon playing a large role as one of the youngest Black male VC’s in the country. Arlan Hamilton at Backstage Capital is opening up her firm’s network by looking “beyond warm introductions”. At Village Capital, we’ve launched VC Pathways, to help Black, Latinx and women founders become investment ready and engage with investors and strategic partners in their respective cities. We hope this program provides the social capital and resources needed to start breaking down these barriers. Ebony Pope is Director of US Ventures at Village Capital. Allie Burns is Managing Director at Village Capital. Learn more on our website and read our insights on Medium. Blog for Village Capital. We're reinventing the system to back the entrepreneurs of the future - a future where business creates equity and long-term prosperity.